A piece of paper that looks like its from some sort of magazine has a smaller, cartoonish map of Canada with a snowflake, deer and several snowsuit-clad cartoons of people watermarked over a red travel route that cycles between several locations in Canada. The red route is meandering and crosses over at points with small red arrows depicting what direction the path is heading in. 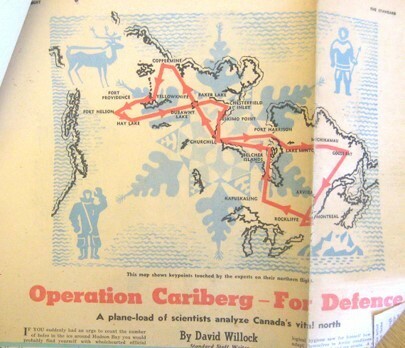 Beneath the map is the beginning of an article titled "Operation Cariberg - For Defence" by David Willock with the subheading "A plane-load of scientists analyze Canada's vital north"
,” Exploring Greenland, accessed April 19, 2019, http://exploringgreenland.org/items/show/13.